If you’re anything like me, you’ve begun to look around the garden and realise all the things you forgot to do last Autumn. Like tidy-up, in any way at all at the end of summer. Not only did our garden end up a water-logged mess during the floods, but the dreadful weather hit before we had time to really get to grips with what professionals call ‘putting the garden to bed’. So, instead of Spring heralding a time to pull back the covers on the weed-free veg patch and rush out to embrace the new season, it was a time to stand around and stare in horror at the task before us. Alongside the collection of raggedy plants and fat slugs, soggy pots and devastated soil lay an equally sad selection of toys – toys that had been out in all weathers, getting broken, dirty and in the case of our beloved Dora ball, deflated. Which is why it was rather nice to let the kids open a box containing a One World Futbol, a nearly indestructible ball that never needs a pump and never goes flat — even when punctured multiple times. This is the sort of ball we need in our (messy and ultimately careless) lives! Tim Jahnigen invented the One World Futbol after watching TV news footage showing young Darfur refugees playing with a makeshift ball made out of rubbish (yes rubbish). Such indestructible spirits deserve better he thought, and so decided to create a ball that could withstand the harsh conditions often faced by those living in refugee camps, disaster areas and other disadvantaged communities. His close, personal friend Sting (like wow!) stumped up the cash to get the project up and running (the name is taken from the “One World (Not Three)” song) - and the rest is history! Now the One World Futbol has now reached more than 160 countries (that’s a lot of happy kids – including mine!). And here's how it works! 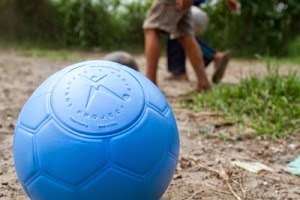 For each One World Futbol you buy, the One World Futbol Project gives a second one to a community in need, in places like refugee camps, war zones, disaster areas and inner cities. Your kids (and you - you know you want one!) get a decent ball that can withstand the rigours of childhood - and some far less fortunate kids get one too - giving you the kind of warm glow that even a typical British Summer can't ruin! I kinda feel like shouting 'GOOOOAAAALLLLLL!!' now - fancy joining in? What a fantastic idea! We had family over for Easter and for the first time (now that all the cousins are that bit older) we played football together in the park. You know what....it was really good fun! Will definitely be doing that again and so may well be needing one of these futbols. Even with 3 females in the family, football can get a bit competitive here - not least between me & DH! I think the balls are perfect for schools and groups too - lots of kicking, throwing, catching without the extra use a meaning they get ruined and then end up in landfill. Thanks for commenting.